Do you remember the Game Keeper? I definitely do. It was a godsend! 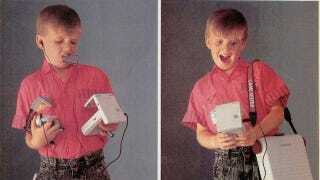 This vintage ad shows how "keeping the Game Boy portable was tough...until now." But wait a minute, what the hell, was it always that bulky? I'm laughing at the ad now—can you imagine carrying that much gear just for your iPhone?—cause my laptop bag is smaller than that thing! But the Game Keeper (an official Nintendo product, mind you) held the Game Boy, a Light Boy, a Rechargeable Battery Pack, Six Game Paks, Game Link and ear phones. A whopping 11 items!